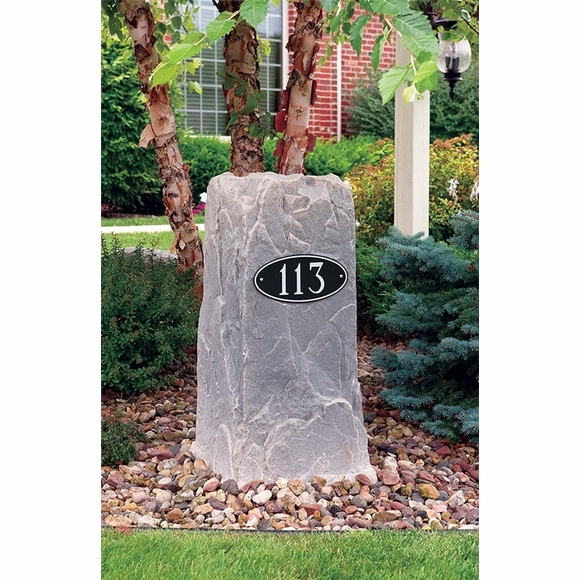 Tall Address Rock Enclosure - - personalized with your house number. Tower shape artificial hollow rock not only hides unsightly utility components but also has a flat face that holds your address sign. Made in USA. Eye-catching 12" x 6" address marker features three-dimensional, metallic-faced characters and trim. Holds up to five characters (including spaces and punctuation). Rock dimensions: 18"W x 17"D x 34"H (note: length & width are taken at the base; height is the highest point). Note: Because the rock shapes are irregular, measurements should be used as a guide only. If you are uncertain as to which artificial rock to order, please send an email to customer service. Please tell us the type of object you will be covering and its dimensions. Artificial rock enclosure hides yard objects that need hiding and includes a personalized house number sign. We bought the address rock to hide a utility box in our front yard. It looks really nice and is the perfect size to hide the utility box completely. We love how it looks! It is light weight and was super easy to install!